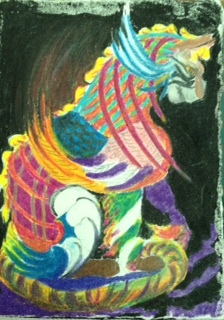 Colored pencil on Bristol board ACEO. July 8, 2012. So this is the answer of sominhetg different I see in this blogs. Seems it has point system What for is that? Anyway, I like this new system because I can see people historical comments by pointing my cursor on their picts. Nice improvement.